All that glittered was not only gold at Kodner Galleries on March 20 as a turquoise, diamond & gold suite brought intense bidding to settle at more than $24,000. 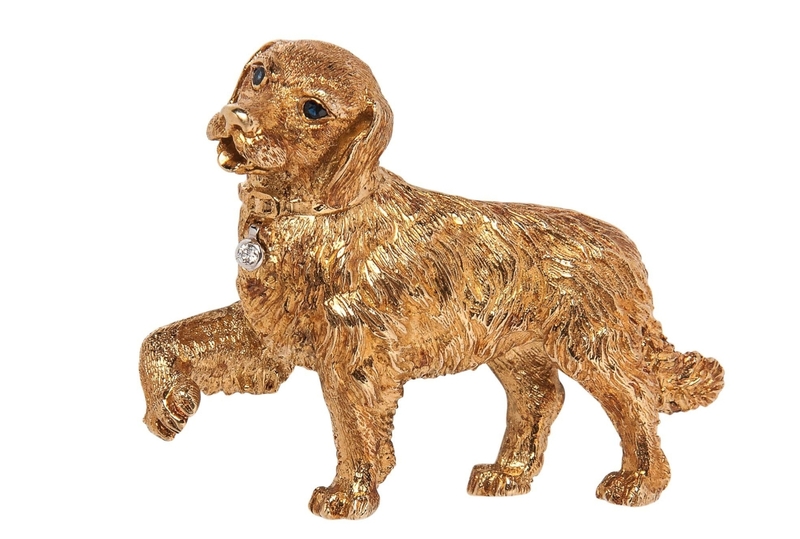 A number of other notable high-fashion lots found their way across the block at Skinner’s online jewelry sale, among them an 18K gold Golden Retriever brooch by Tiffany & Co., which brought the gavel down at more than $4,000. An undated illustrated trade catalog for the West Meriden, Conn., manufacturing company Brandley & Hubbard blew through its $80/120 estimate to land at $12,870. 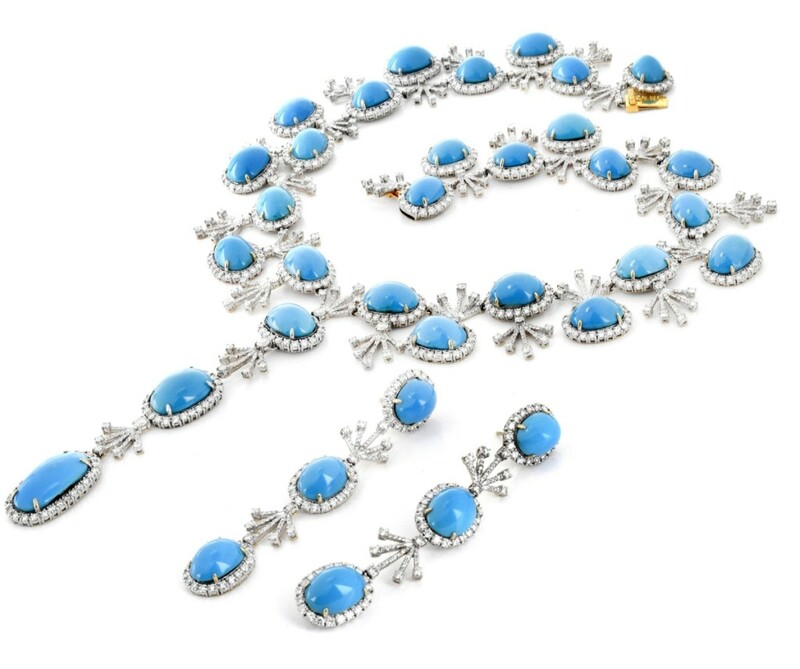 DANIA BEACH, FLA. – On March 20 at Kodner Galleries’ evening auction, a vintage cabochon Persian turquoise, an approximately 35.0-carat round brilliant cut diamond and 18K white and yellow gold necklace and earring suite, was the subject of intense bidding before settling at $24,200. For information, www.kodner.com or 954-925-2550. 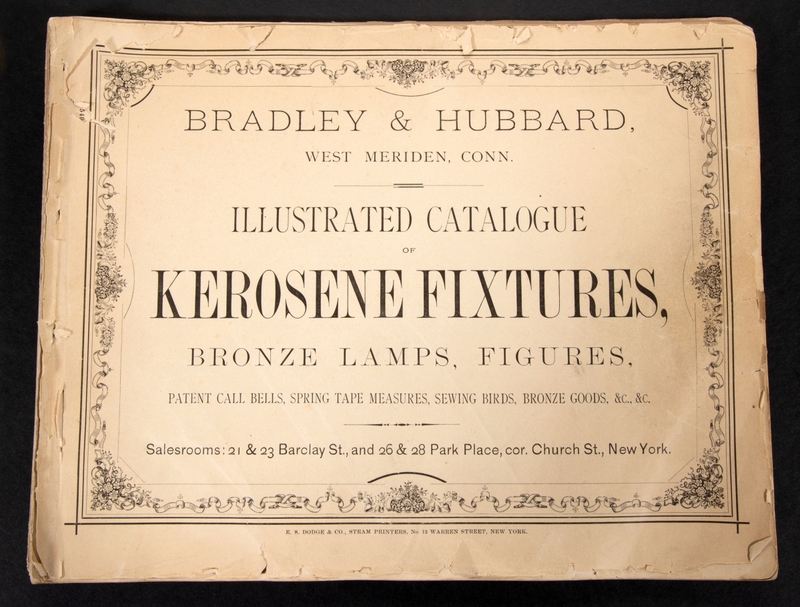 MOUNT CRAWFORD, VA. – Lighting the way at Jeffrey S. Evans’ March 23 sale of Nineteenth and Twentieth Century lighting was an undated illustrated trade catalog for the West Meriden, Conn., manufacturing company Bradley & Hubbard. The lot soared past its estimate of $80/120 to sell for $12,870 to a collector of Bradley & Hubbard lighting who was bidding online against an online underbidder. According to Evans, the catalog was important because it allows for an attribution to Bradley & Hubbard for lamps that have previously been unattributed. Evans said the new owner thought the catalog could be dated to late 1873 or early 1874 and, at 106 pages, was the earliest complete Bradley & Hubbard catalog known. For information, www.jeffreysevans.com or 540-434-3939. NEW YORK CITY – Swann Galleries’ autographs sale on March 21 was led by an autograph letter signed “Jos. Brant/Thayeadangea” to an unnamed recipient reporting on his meeting with George III to pledge support against the American Revolutionaries. The letter brought $35,000, just over its high estimate. Brant (1742-1807), whose Indian name Thayendanegea, was a Mohawk Indian chief who served not only as a spokesman for his people but also as a Christian missionary and a British military officer during the American Revolution (1775-83). 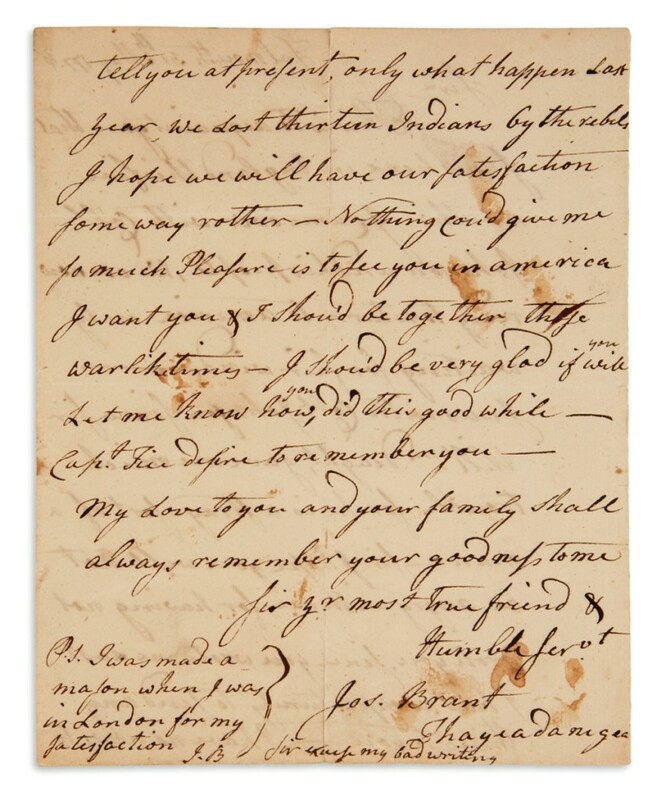 This letter had been on temporary loan to the Museum of the American Revolution in Philadelphia, where it was displayed in the museum’s permanent exhibition space between June and November 2018. For information, 212-254-4710 or www.swanngalleries.com. WINDSOR, CONN. – Hooded chairs, which exude a sense of drama and ceremony, provide amply high sides to protect from draughts and are also acoustically helpful. The tufted example in Nadeau’s Auction Gallery’s March 23 sale was equally helpful in the form of a storage door in its base. 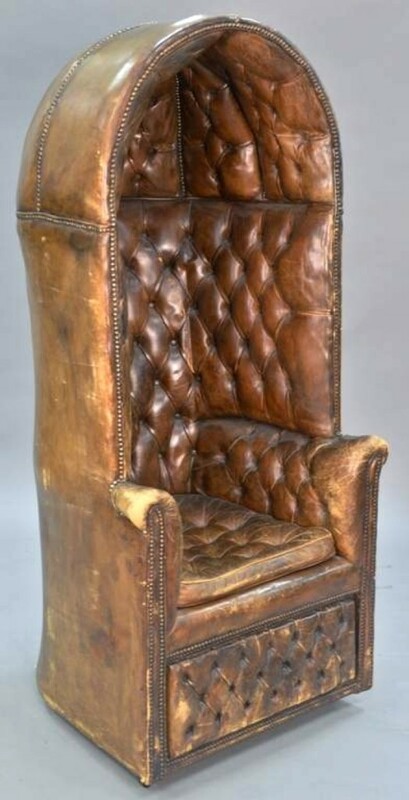 Reaching 69 inches in height and 31 inches in width, the chair settled at $2,858. For information, 860-246-2444 or www.nadeausauction.com. BOSTON – Collectors seeking to acquire antique and contemporary pieces priced under $10,000 found plenty to choose from in Skinner’s online jewelry sale that closed March 12. Offered examples from Eighteenth through Twentieth Centuries from notable makers included Tiffany & Co., Buccellati, Gurhan, Lalaounis and Bulgari. Bidders competed for contemporary signed jewelry, particularly examples by top designers or unique and whimsical designs. Examples selling for well-over estimate included a platinum and diamond “Diamonds by the Yard” necklace, Elsa Peretti, Tiffany & Co., which sold for $12,300; 18K gold, black jade,and mother-of-pearl earrings, Angela Cummings, $4,613; and a whimsical 18K gold Golden Retriever brooch (pictured), Tiffany & Co., Germany, circa 1993, fetched $4,613. For information, www.skinnerinc.com or 617-350-5400. LOS ANGELES – There were two notable lots in Bonhams’ Elegant Home sale, March 25-26. 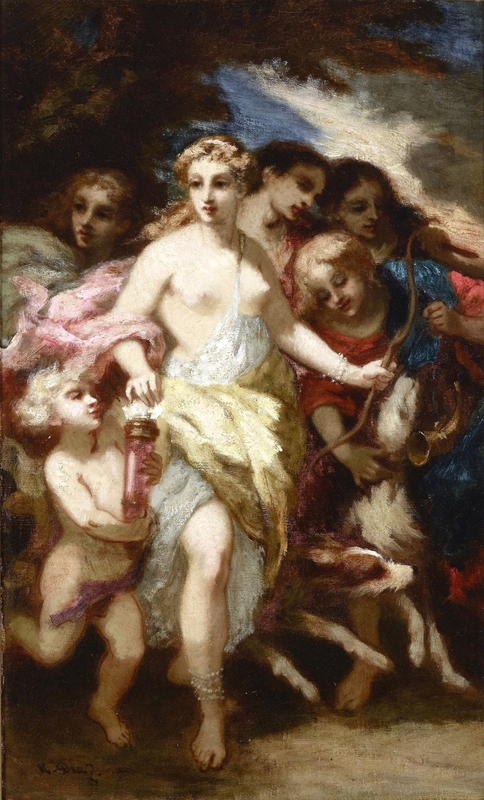 Property from the Nina Hartwell Trust contributed an oil on canvas (shown) by Narcisse Virgile Diaz de la Peña (French, 1808-1876) that finished at $22,575 above its $15,000 high estimate. A carved and painted carousel horse attributed to the Dentzel workshop, Philadelphia, early Twentieth Century, pranced to $15,075. The French painting, “Départ de Diane pour la chasse,” signed “N. Diaz” lower left, measured 21¾ by 13½ inches. Diaz de la Peña painted this subject with little variations at least seven times. They are dated between 1839 to 1869, with the largest and most detailed composition currently in the collection of the Metropolitan Museum of Art, New York. The carousel horse had provenance to Knott’s Berry Farm, Anaheim, Calif. For information, 323-850-7500 or www.bonhams.com. NEW YORK CITY – Doyle’s auction of paintings on March 12 continued the success of this new auction category of affordable works of art. Showcasing more than 120 lots of traditional, academic and early Modern paintings, the sale attracted seasoned buyers and new collectors alike. Highlighting the sale was “Girl in a Landscape,” a 1963 mixed media and oil on silk by Le Thi Luu (Vietnamese, 1911-1988), that soared over its estimate of $4/6,000 to achieve $31,250. 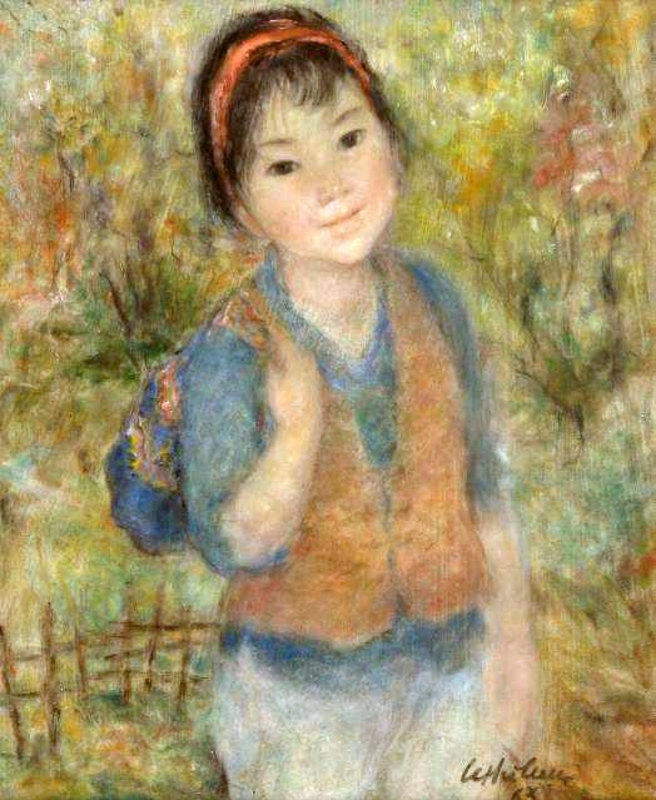 Le Thi Luu emigrated from Hanoi to Paris in the 1930s to pursue her career as an artist. Along with fellow alumni, Le Pho, Nguyen Phan Chanh and Mai Trung Thu, she was one of the pioneers of Vietnamese silk paintings and is regarded as one of its masters by the younger generations of Vietnamese artists. For information, 212-427-4141 or www.doyle.com. THOMASTON, MAINE – Thomaston Place Auction Galleries’ online Discovery auction, which closed on March 27, presented a diversity of rare and decorative items. The 377-lot sale included original paintings, Asian antiques, collectibles, rare books and documents, pottery, art glass, furniture and more. There were several lots of Asian items with results that greatly exceeded expectations. 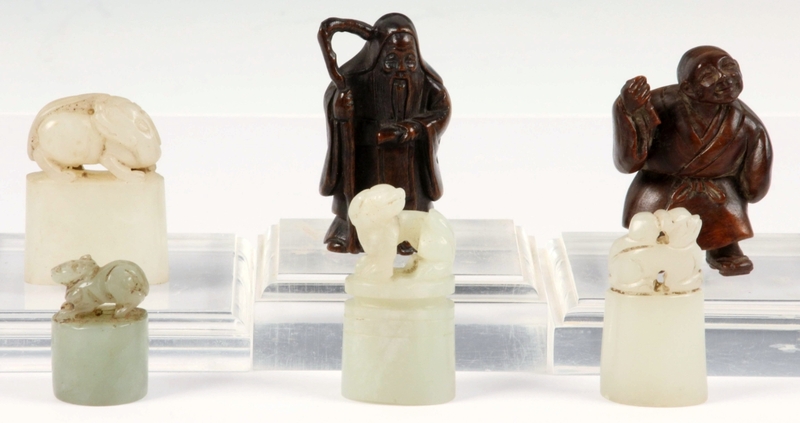 One was a collection of six Japanese and Chinese miniature carvings, including two rosewood figural netsuke, roughly 2 inches tall, plus four Chinese jade miniature seals, with uncut flats, 1-1/8 to 1-5/8 inches. Estimated at just $200/300, the group sold for $2,400. For information, 207-354-8141 or www.thomastonauction.com. 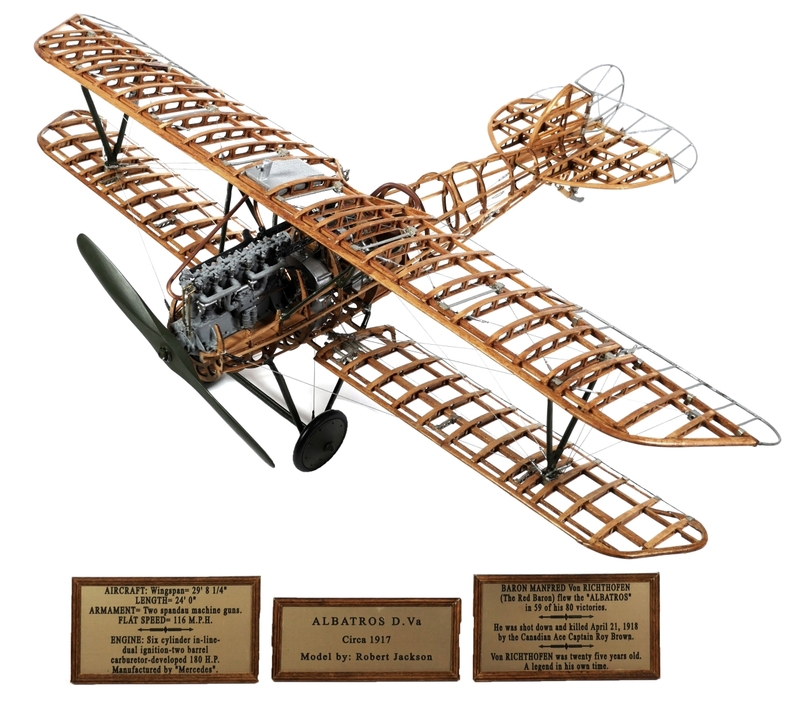 CLEARWATER, FLA. – A vintage Albatros D.Va wood and metal model of Manfred von Richthofen’s World War I aircraft soared away from its $400/800 estimate to land at $6,600 at Blackwell Auctions’ March 16 sale. The model of the plane in which von Richthofen – also known as the Red Baron – flew 59 of his 80 successful dogfights had a wingspan of 22½ inches, had moving parts, was built to 1/16 scale and came with a custom Plexiglas case. The winner of this particular dogfight was bidding online, through www.invaluable.com. For information, 727-546-0200 or www.blackwellauctions.com.